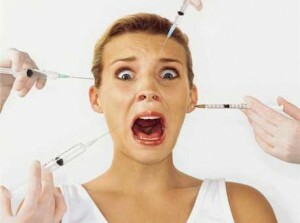 Do you want to look younger now, but without all of the injections, fillers or surgery? What makes some people who are well into their forties look 30’ish’, while others look much older than their age? How we age is in part determined by our genetics, but also greatly influenced by lifestyle. The most powerful lifestyle anti-ager of all is exercise. Exercise affects how we look, how we feel, how we think, how likely we are to get sick, as well as improve (and preserve) our physical fitness. In the 80’s we became familiar with the phrase “Use it or lose it“, and that pretty much sums it up. To stay looking (and feeling) young we need to exercise. Just how does exercise keep us looking younger? Increased human growth hormone (HGH)– The right kind of exercise can stimulate the production of HGH. As we age declining levels of this hormone contribute to increased body fat, lack of muscle tone, wrinkles, loss of energy, saggy skin and an expanding waistline! Higher metabolic rate- It is harder to lose weight after 40! But it isn’t impossible. Exercise boosts your metabolic rate. This is the key to getting lean and staying lean after 40. Better muscle tone- By improving muscle tone exercise helps us maintain a youthful appearance (flatter mid section, better posture, well toned leg…). Enhanced detoxification (for more beautiful looking skin)- By increasing blood circulation (bringing nutrients to cells), and enhancing lymph fluid circulation (which removes toxins) exercise promotes detoxification. Among the benefits of enhanced detoxification is healthier, more beautiful, younger looking skin! Younger DNA?- Researchers have found that individuals who exercise about three hours a week had DNA that appeared to be about nine years younger than that of their more sedentary counterparts. There is something you can do to look and feel younger: EXERCISE. How you exercise is the key to obtaining all its potential benefits. Let one of our certified personal trainers show you how you can reap the full benefits of exercise by getting a program specifically designed for you. If you would like to learn more call the Fitness Advantage training center (909) 396-0309.